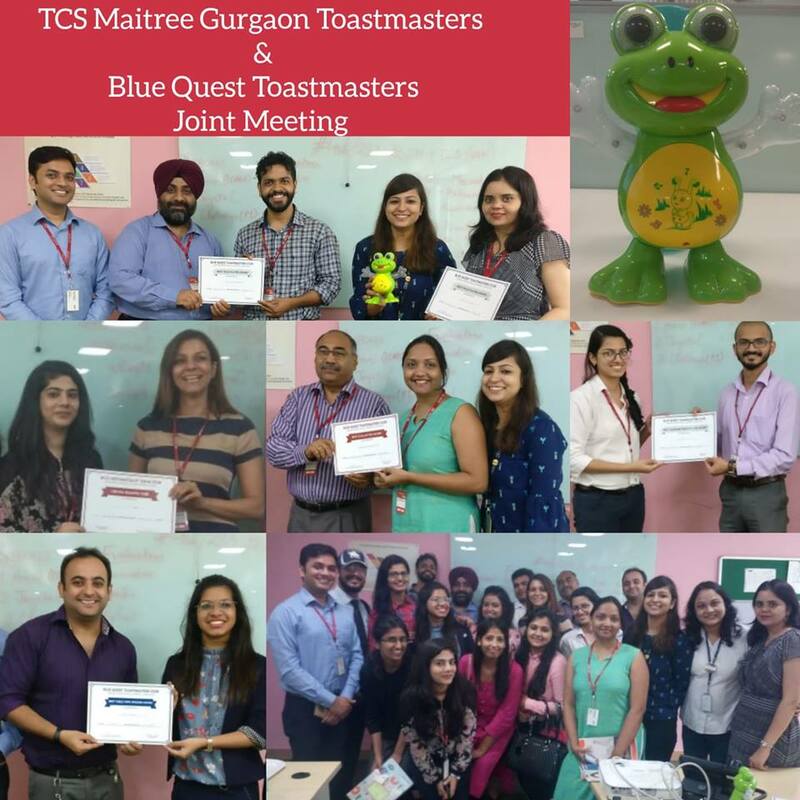 There’s a saying “Everything magical happens outside your comfort zone” and we at TCS Maitree Gurgaon Toastmasters Club witnessed it a few days back. 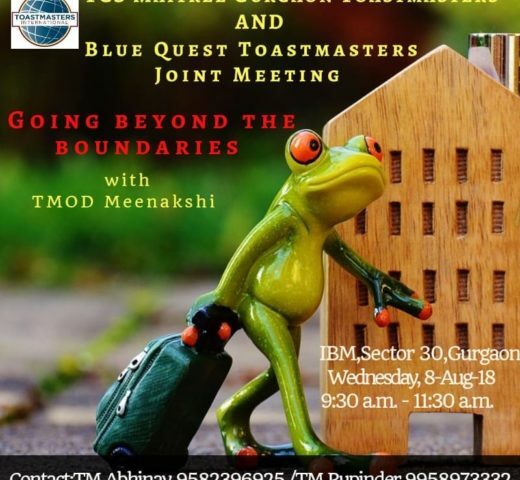 As the newly elected club officers were attending COTP on a bright Saturday morning and networking with fellow club officers of other clubs, one of the Presidents (TM Arushi Gupta, BlueQuest Toastmasters) suggested the idea of a joint meeting in the following week at their office. Though the idea sounds great but it has its own set of complications; especially when you run a corporate club. 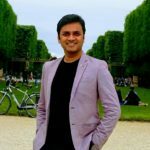 For a corporate club, the office is its cocoon where every member feels safe, a comfort zone from where no one wants to go out. 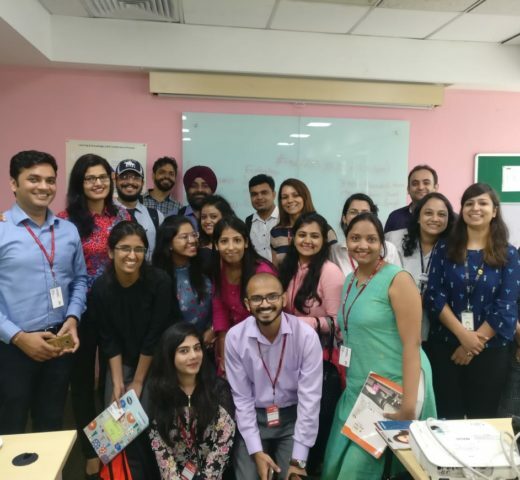 Many a times it works as an advantage for members as they can participate in Toastmasters meet by taking out an hour from their busy schedule and quickly get back to work as soon as the meeting is over. In a short span of time, members become accustomed to each other and feel relaxed while performing their roles in front of like-minded and known audience. But it also limits their growth as a public speaker. Leaving out the comfort zone and going beyond one’s own boundaries is essential for a good public speaker. A public speaker grows by receiving feedback and reactions from varied audience. A speech that works for one audience may not work for others. The confidence level may vary in a different environment and among different audience. That provides an opportunity for a GOOD public speaker to become BETTER and that’s where a corporate club lacks. So when this idea of a joint meeting was proposed, I was skeptical at first but accepted it for the benefit of my club members. The meeting was set and the roles were divided among the clubs. When the idea was introduced to the club members, some welcomed it with open arms while the others were hesitant to move out of the cocoon and go to another place. But with persistent motivation by our newly elected EC, we managed to gather a decent number. The theme “Going Beyond The Boundaries” was set to depict the efforts both the corporate clubs had put in for the success of the meeting. The meeting poster also depicting the theme shows a frog from a well who has decided to go beyond the boundaries of his well and see the world. YES. But it lasted only a few minutes. 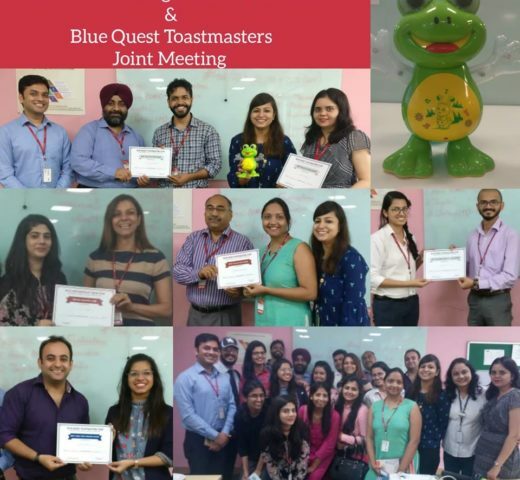 Thanks to the hospitality of BlueQuest Toastmasters Club. YES. There was a lot to learn from each other .From how to collaborate to how to introduce each other and even how to play the roles differently. There was a lot to observe and learn. Well, the smiles in the club picture will tell you that. I have received a lot of accolades from my club members for organizing it and they are dying to have another such meeting. 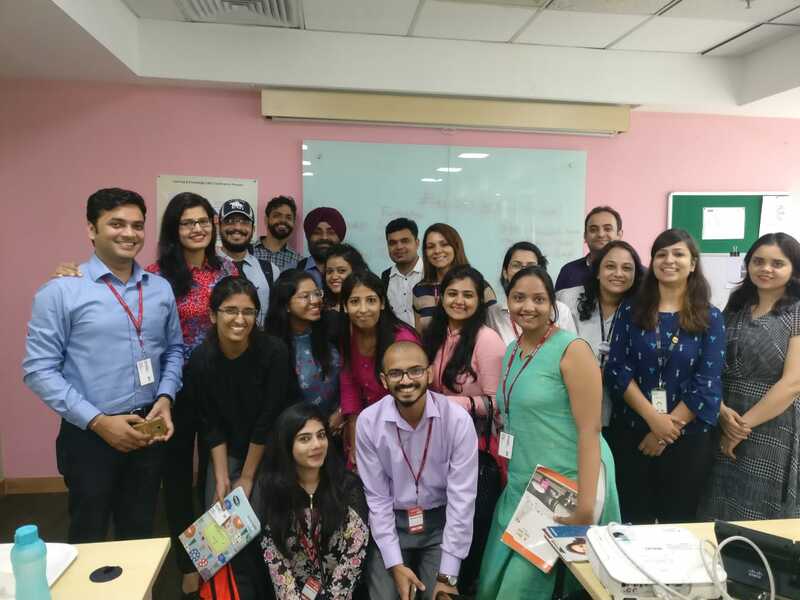 Going beyond the boundaries is a wonderful experience which enables learning and sharing. Move out and embrace the world and you’ll see the magic happening all around. I was there. It was fun. Proud of my clubs!